Sewing with stretch fabrics is something that I kept away from for ages. But I needn’t have – why did I worry? There are a few simple things to bear in mind. First of all make sure you have the right needle. What you need is a jersey or ballpoint needle. Easy to find in any sewing shop, they have a slightly rounded (or blunt) end which means that they don’t ladder the structure of the knitted fabric. Have a look at your sewing machine manual to learn how to adjust the pressure on the presser foot. It’s not always possible but, if you can reduce the pressure, it helps the two layers of fabric go through the machine at the same rate. Or, if you have a walking foot with your machine, then that does the same thing and is ideal. Secondly choose your stitch for the job – this can either be a straight stretch stitch – which probably looks like this (see left) on your sewing machine. Thirdly, try really hard not to stretch the fabric as it goes through the machine. It needs to feed through evenly neither stretching not scrunching up. 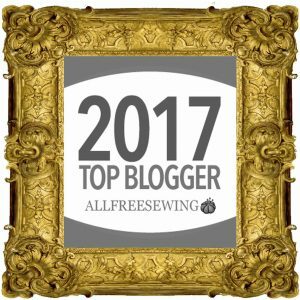 If you do have an overlocker then – brilliant – use it. 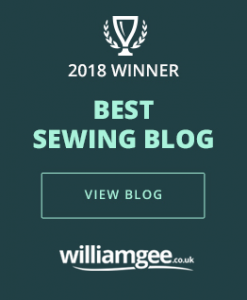 There is no doubt that they are brilliant for sewing with stretch fabrics but it is not necessary to have an overlocker to tackle stretch fabrics. Thanks for the advice. I recently sewed a romper for my baby but the neck is all loose and flappy, having used a zigzag stitch with a turnover. Do you think facing it might be more effective and get rid of the looseness? 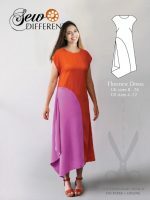 To Laura Casey: I like your advice about the ric rac for stabilizing a neckline. If you can weave skinny elastic (it comes on a spool) through the zig zags, you can tighten the neckline. Waaaaay back in hi school my friend showed me how to do this for stretched out sweater necks. 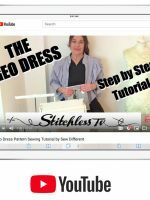 Sewing with nancy has a youtube video tgat shows sewing in clear streach elastic in the neck line to hold shape and have some streach and sprong back motion. Pretty cool. Your information is encouraging and very helpful. Thanks for sharing. I have an outfit that I love,but don’t wear it very often, the sleeves are small, how doI enlarge them? I do not wear sleeveless. I have big arms! 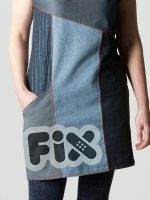 This is a tricky job and you will need some extra fabric that matches your sleeve fabric. It will need to be a couple of inches wide (or however much extra fabric you need to make it comfortable, and the length of the seam on the underside of your sleeve from the sleeve opening to the body of the dress.) You will need to cut open the seam that runs along the underside of the sleeve all the way to the body of the dress. Into this split you will need to insert your new piece of fabric . Obviously this long thin rectangle of fabric can be square at the open end of the sleeve but will need to taper down to a point towards the body. 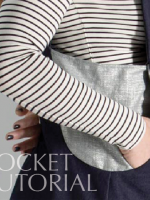 With some care you can extend and the extra insert won’t be too noticeable as it is hidden under your arm. I saw this on Pinterest for making bouses looser. Use lace to enlarge your sleeve. at the top. Very cute. And lace is an “IN” thing now; or it was in 2016.
i have been sewing since I was 10 years old. Self taught and struggled with stretch sewing forever. Thank you so much for the tips. Wonderful blog. Like you i steer clear of stretch fabric but im going to have a go thanks….. I am a little past a beginner sewer. I want to sew knits but can’t find anyone to help me, they all tell me to forget it that they never sew with knits, but that’s mostly the type clothes I want to sew. I’m so frustrated. Thank you for this blog, I have hopes of being able to conquer this now?? Knits are wonderful, but they are not all created equal: different fibers don’t all react the same in the laundry, some are fairly heavyweight, some very thin, some extremely stretchy & some not so much, some are slinky & body hugging, some are kind of stiff, they each have special considerations to make them “behave” while sewing. To help me develop techniques to help me with their differences I went online to http://www.girlcharlee.com, I have no relationship with them–only that I had used them in the past. You can get a bargain batch of quarter YD or more fabric weighing 5lbs with lots of variety, stretches & textures to practices sewing techniques on. Try different ways to hem, different joining stitches & even stretch threads til you get the look you like & staple notes to the samples. Sometimes these bargain lots are on sale, I think I paid about $15 or so. It was well worth it; I learned which knits were pretty easy to work with & which ones weren’t worth the trouble, without investing in fabric that I would only be disappointed in. It gave me the confidence to purchase knits I liked without apprehension. Hi dear. I read your blog everything you said it’s really very helpful but can you show in detail about neck thing that how to stabilise it. 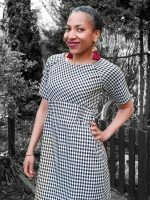 I have made one dress and my knit is very stretchable. I’m not happy with my neck line at all. It Will be great if you can solve this. Difference between double and single kints. Enjoy your tips and want to be on your mailing list. I love to see! I just came across your article just now. I love fabrics and sewing but i have not tackle any sewing projects because I am still working and maybe it is too late for me at the my age 64. By the way, you look like Helen Mirren, the actress. It’s never too late! Start now – you’ll soon pick it up.